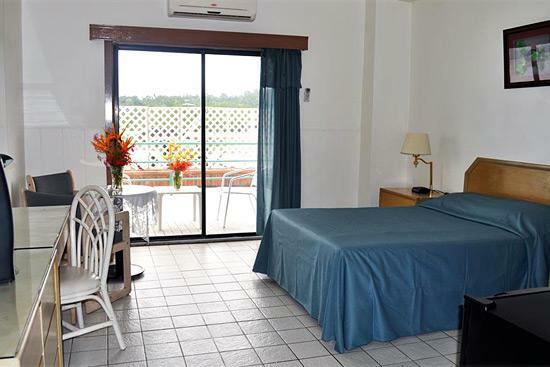 West Plaza Hotel by the Sea is located on the waterfront and within a 10-minute walk to downtown Koror. This Hotel is a good solution for those who look at the budget and wish to spend an active holiday by favoring excursions to Resort life. The West Plaza by the Sea, while facing the sea has no swimming beach or direct access to the sea. 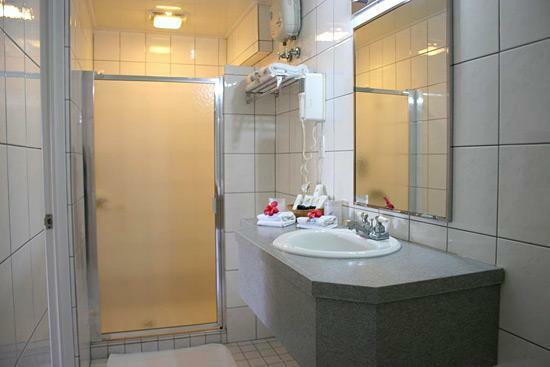 The good level of services guarantees a comfortable stay. the Red Rooster Cafe, open from 6AM-2PM and 5PM-10PM daily except Tuesdays (6AM-10AM only). The cafe specializes in American casual dining - pizza, fried chicken, burgers - as well as Pacific Rim dishes. The nightly happy hour features Palau's only locally-brewed beer on tap, Red Rooster Draft. 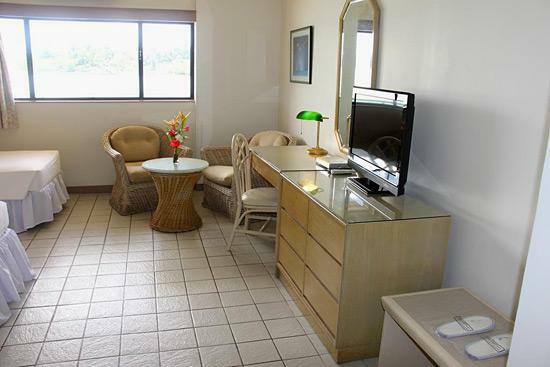 The Hotel offers a rental car service, West Car Rental, located in the lobby of the hotel. It's open daily from 8am to 5pm and during flight arrival and departure times. West Car Rental offers a wide range of vehicles from economy class to full size sedans. For the truly adventurous, 4X4s and SUVs are also available. Rental car reservations can be made through our central reservation desk. 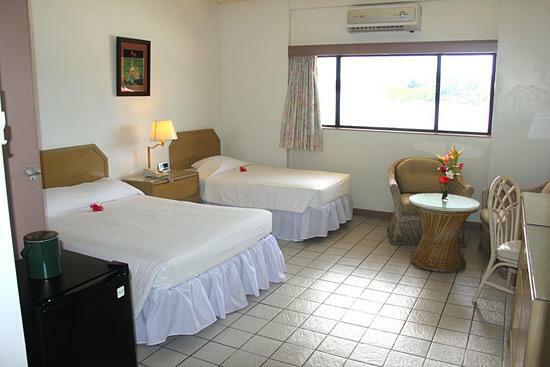 The Hotel features 36 rooms overlooking the ocean and nearby islands. Rooms range from standard class to deluxe rooms with kitchenettes, and a penthouse suite on the roof deck with a private veranda. Information pursuant to D.Lgs.196 / 2003 We wish to inform you of the requirements of art. 13 of Legislative Decree no. 196/2003, which includes provisions for the protection of persons and other subjects regarding the processing of personal data. According to the law your indicated data will be: * Processed lawfully and fairly; * Collected and recorded for specific, explicit and legitimate purposes; * Accurate and, where necessary, updated as a result of your notification, * Adequate, relevant and not excessive in relation to the formality of the treatment; thereby safeguarding your privacy and your rights. Under Article. 13 of the law, then we hereby provide the following information. The personal data in our possession are collected directly from individual customers on the occasion of bids and / or during a report or a proposal for service. Data can also be collected from third parties, such as, but not limited to, data acquired from external society for the purpose of commercial information or market research or from our other customers or suppliers. The data provided to us, are subject, for our part, of IT or manual data processing, for purposes of: * Legal obligations related to civil, tax, accounting and certification of quality; the administrative management of the relationship; the fulfillment of contractual obligations, and provisions issued by state regulations and legitimated by law and by the vigilance and control. * Information on future initiatives and announcements of new services. We inform you that personal data provided by you or acquired in the course of the contractual relationship may be disclosed to the following persons who perform functions closely related and instrumental to our business, functions that need to be considered as essential for operations of the society: a) to the Financial Administration, to social security agencies if necessary, to the public safety; b) to carriers or other entities for services ancillary to the supply; c) to society or professional bodies for fraud control and debt collection; d) to banks and financial institutions involved in the financial management; e) to insurance companies; f) to subjects in charge to budget review and administrative, fiscal and contractual The personal information you provide may also be disclosed to other society of our group for the coordination of management activities, even abroad, both within the EU and Extra EU. Your data will not be disseminated. We underline that the processing of data for the respected purposes indicated in point a) is mandatory and essential for the fulfillment of the mandate given to us by you, while it is optional for the purposes of point b), and thus there are no consequences in case of your refusal, if not our impossibility to assure your information on the developments of our offers. We assure you that the treatment, carried out with or without the help of electronic or automated means, of your data will be using instruments that guarantee security and confidentiality. It can comprise one or more of the following operations on the data: collection, recording, organization, storage, processing, modification, extraction, comparison, use, interconnection, blocking, communication, cancellation, destruction. Owner of data processing is the umbrella Travel Ltd., with registered office in Via Matteotti 18, 20028 San Vittore Olona (MI), which will use them for the respected purposes above and from which customers can at any time exercise the rights of art. 7 of Legislative Decree no. 196/2003, attached the full text. Further information can be obtained from our company. We inform you also that unless otherwise provided that you have to send in written form, we accepted for the consent as provided herein. L'Ombrellone Viaggi Srl Art. 7 (Right of access to personal data and other rights) 1. You have the right to obtain confirmation as to whether or not personal data concerning him, even if not yet recorded, and their communication in intelligible form. 2. You have the right to obtain information: a) the origin of personal data; b) the purposes and methods of treatment; c) the logic applied in case of treatment with electronic instruments; d) the identity of the owner, manager and the representative appointed under article 5, paragraph 2; e) subjects or categories of persons to whom the data may be communicated or who can learn about them as appointed representative in the State, managers or agents. 3. You have the right to: a) updating, rectification or, when interested, integration of data; b) the cancellation, anonymization or blocking of data processed unlawfully, including data whose retention is unnecessary for the purposes for which the data were collected or subsequently processed; c) certification that the operations in letters a) and b) have been notified, also as regards their content, to those to whom the data were communicated or disclosed, except if this requirement It proves impossible or involves a manifestly disproportionate to the protected right. 4. You have the right to object, in whole or in part: a) for legitimate reasons the processing of personal data, pertinent for collection purposes; b) to the processing of personal data for purposes of sending advertising materials or direct selling or for carrying out market research or commercial communication. webwork by webworks.it - copyright © 2015-2019 - all rights reserved.